This Cranberry Dill Cheese Ball is the perfect appetizer for your Thanksgiving or Christmas party this year. The sweet and savory aspect makes it absolutely addicting. Anyway, let us continue shall we? I’ve told you guys before how much I enjoy Thanksgiving. I used to hate it, now I love it. I’d be lying if I said that the love originated from anything else other than food. I mean, the holidays are all about splurging a little. I’m not talking the wasteful, gluttonous splurging… I’m talking the sacrifice-an-extra-8-hours-more-than-you-normally-would-to-prepare-dinner kind of splurging. My Turkey-days of the past were spent watching and waiting for someone else to cook. Not only did I not give any love in the meal making, but because I was so young and dumb, I didn’t recognize the love that was mixed into each bite. All of this might sound cheesy… love is an ingredient? I’m telling you peeps, food made with love tastes better. So how do you make food with love for Thanksgiving? Well, one part of it that I learned last year is to make food you can count on, food that you know people will enjoy. Seeing the smiles on the faces of someone dipping into your Thanksgiving pie, or the compliments for the cheese ball, these things are bound to make you love cooking! Not only that but my gratitude meter goes up at least 7 notches when people are loving my food. See? Thanksgiving can be great! Okay, I’m going to stop writing now… man… this cheese ball… can’t stop salivating. Happy Thanksgiving everyone! Splurge a little. Spend more time on making your food. Give it some love. 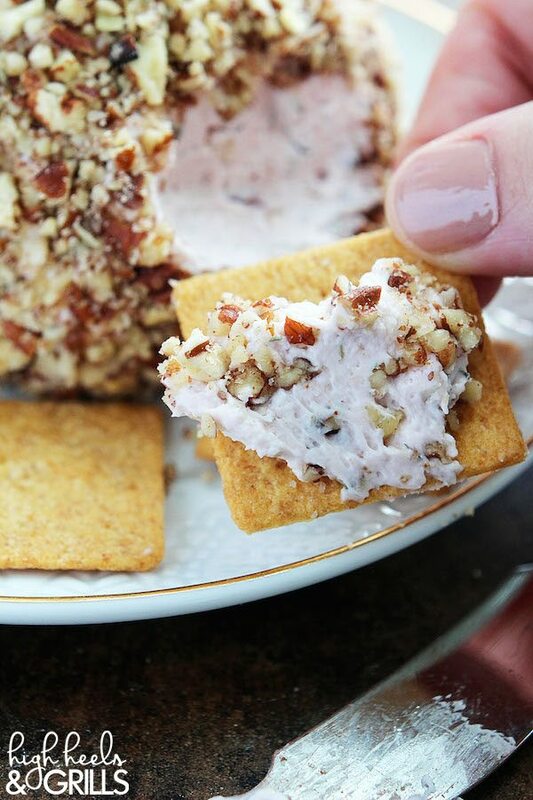 This Cranberry Dill Cheese Ball is the perfect appetizer for your Thanksgiving or Christmas party this year! The sweet and savory aspect makes it so addicting! In a medium bowl, whip the cream cheese until smooth. Add the cranberry sauce, dill, and onion and mix until fully incorporated. Place a square of plastic wrap on the counter. Scoop out all of the cheese ball mixture and for it into a ball. 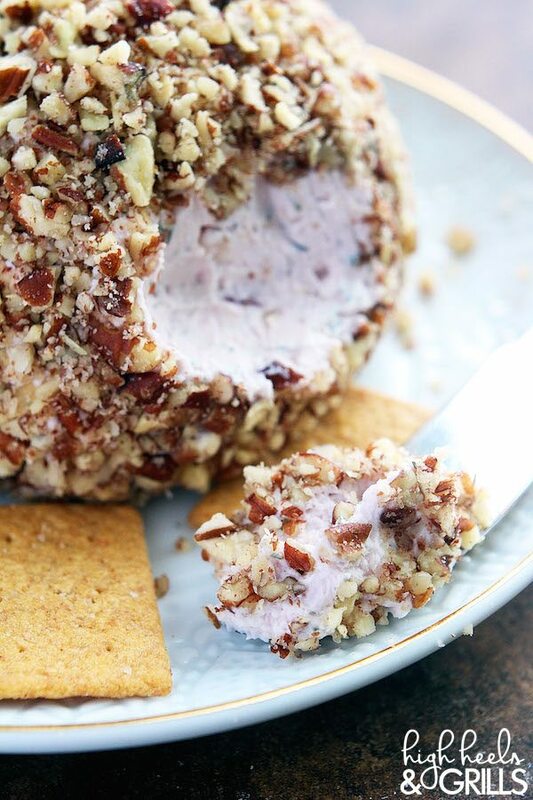 Place the cream cheese mixture in the middle of the plastic wrap and place in the freezer for one hour. Pulse the pecans in a food processor until small bits form. Transfer it to a shallow bowl. 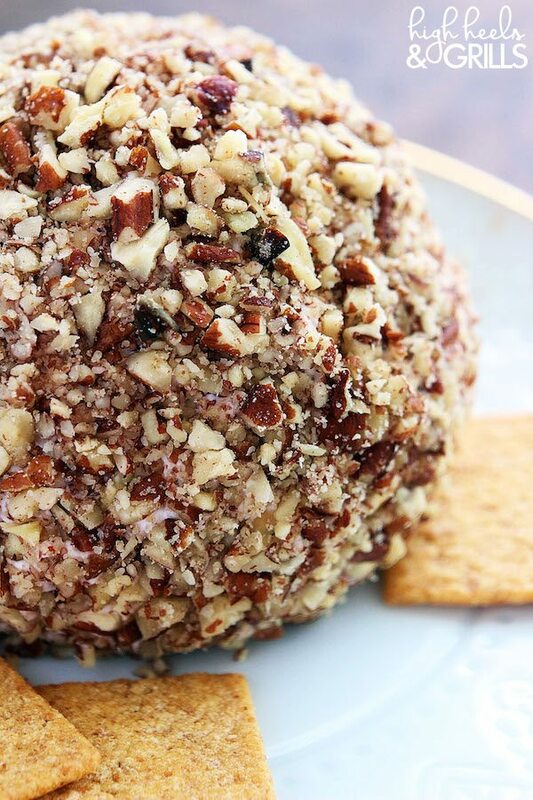 Take the cheese ball out of the freezer and remove the plastic wrap. 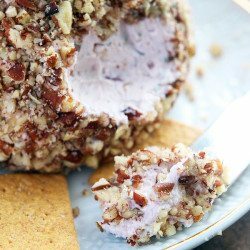 Form into a firmer ball and then roll it in the pecans.